This is a call to participate in and support the work of activating the Ossipee Mt. Star Gate. This Star Gate activation was first suggested by an Indigo being, whom I respect very much, known as Grandmother Chandra. Questions arise about the function and dynamics of a Star Gate that I can not answer however, allow me to surmise. My contribution in all this is to identify -through gaiagraphic geometry of place techniques- the nuts and bolts of this highly energetic site in the Ossipee Mountains of New Hampshire. It is my hope that through this communique' others more versed in portal work would come forward to assist, contribute, and guide a righteous activation of this portal/ vent/ receiver. The Ossipees are located in the Lake Winnipesaukee region of New Hampshire in the northeastern United States. This one time volcano is part of the White Mountain's orogeny. For those familiar with my book Gaia Matrix the Ossipee Mts. 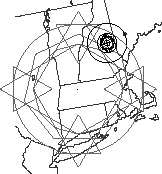 are part of a landscape dynamic I refer to as the "Ossipee Temple Complex" or the Compass Rose of Gaia's Matrix. 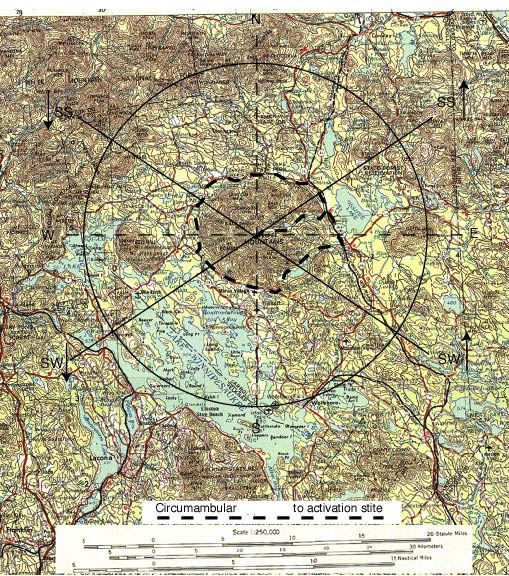 Placement of the circular form of the Ossipees and the of nearby hills/ mountains generate a great pyramid triangle that points north to Mt. Washington. The Ossipee Mts. are a naturally occurring and a classically delineated sacred space. The grace and syncretic expression of the Earth is clearly laid out here. The Amerindians of the region called the nearby Lake Winnipesaukee, "the smile of the Great Spirit". Cultures historically ordain a site sacred if it incorporates certain general characteristics. Seven such markers are the seven sacred direction: North, South, East,West, above, below, and within/ center. The Ossipee (nature's)Temple, or in present terms, Star Gate, does just that. Further supporting this premise are the place names given using red, green, white, and black for land features that correspond to labeling the four cardinal directions. Another feature of historic sacred precincts is that of a solar orientation; doors/ altars/ pyramids facing the illumination of the rising sun on the equinox, or an object stone that anchors summer solstice sunrise, as with the case of Stonehenge. These adjunct solar features are often manmade but do, given the site, have horizon features that reinforce these orientations. In the case of the Ossipee Star Gate Temple all these sacred space features occur naturally in a very clear and direct manner. The Ossipee Mountains are a long extinct volcanic vent. Geologically their referred to as a Ring Dike. This volcano was once 4 miles higher, this remnant is the harden volcanic lava core that contracted when cooled- allowing quartzite to flow around this lava-creating a ring. While not a geologist, what I have learned is that according to the theories of plate tectonic and drift, the continent of Africa was once located here and has been pushed eastward by the volcanic growth of the North American plate. This process is still active today in places like Iceland and the Mid Atlantic Rift. 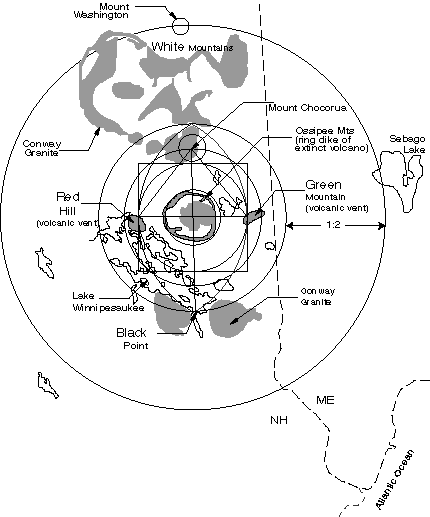 The White Mountain orogeny of which the Ossipee volcano is a part, initialized this continental expansion. The eastern edge of ancient North American or Laurentian Plate begins in neighboring Vermont. Ossipee's ring of quartz being harder than the Conway Granite core has eroded more slowly leaving a cupped ring of mountains. There however is a tongue of quartz mountains, off the main dike, that points inward towards the center of this volcanic vent. Syncreticly this tongue aligns exactly with the point at which the Summer Solstice sunrises over the horizon at this latitude of 43 degree north, at this time in history. Surface vortex is a 5 th dimensional projection of earth's vortexing interior. 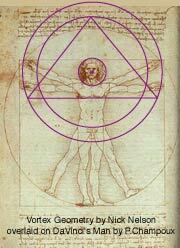 humans, who when crucified or spun with Unity consciousness becomes a Star Gate for the earth in total. The relative location and geometry of the Ossipee portal to the Arkhom- Gaian Matrix is a fractal or miniature form of this greater landscape vortex geometric making this place a: key way, portal or gate through which Star Knowledge may flow into the Arkhom. So the givens here are that we have a highly energetic quartzite geologic formation that: projects skyward through its mountainous heights, roots deeply to the earth's core via its lava column, scribes a sacred circle, it's mountainous tongue/ phallus are aligned with the summer solstice sunrise, is marked by granite plutons in the cardinal direction while at the same time referencing a pyramidal angle, surrounded by memory bearing waters, in a spot that can once again initialize the physical/ evolutionary expansion of the earth. In total a picture emerges of a vortex 5th dimensional Star Gate. As to the when and where this activation should take place are both determined by the Ossipee Mountains. Their alignment is to the summer solstice sunrise,which determines the time and point to a place at the center of the mountains at a branch of the Lovell River. That said any time as well would be a good time, as Star Gates and sacred sites require maintenance or hygiene to function optimally, much as humans do. Physically/ ethericaly part of the Arkhom spin field, Ossipee and the surrounding lakes holds and expresses the dynamic Light Fields of major population like Boston and NYC. Working geomantically through the Ossipee Star Gate one is able to key into the greater Gaian Matrix of the Arkhom Geometry: itself is a central gaiagraphic/ vortex structure of a continent. Given all these givens, it is prudent to proceed with caution. Turning this key opens a gateway to the unknown no matter how pure the intention and clear the focus. Caution is the better part of valor. This said, I very much want to be a part of working on the land and with Light Groups with this site, as my depth knowledge and connection with dynamic would ground life sustaining light work at this site. Activating this Ossipee Star Gate would provide a conduit through which the celestial stellar/ planetary forces, impacting us at this historic spiritual juncture, to ground in a sacred and physical context. As a volcano and vortex this Star Gate is both vent and doorway for the earth. As a Ring Dike, Ossipee radiates omnidirectionally and omnidimensionally, as it grounds itself physically in the seven sacred directions. With their quartzite mountains, the Ossipee acts as transducer both transmitting and receiving all intentions/ subtle energetics projected by Divine, human, devic, angelic, hierarchical, and cosmic agencies that assist in raising all 'boats' consciously, and hopefully, humbly fulfilling God's plan here on earth. The Ossipee Star Gate would be a V(ery)L(arge)A(rray) device that could focus and project a full-light spectrum into the bodies, hearts and souls of all. What comes to mind when I think of the Ossipee Star Gate is a column of light as wide as the Ossipee mountains that connects the central sun of the Earths core with the central sun of Unity Consciousness. Peter, Your really do GOOD WORK! Ascension-wise it appears to me that you have the lead for grid work in this continent. I don't know the others here but the little bit I've seen of local work, you have the key in Arkhom. I don't know what a "Star Gate" is; I suppose everyone has an idea about one, like the Grail, so I can't address that aspect. I'll keep to the Reshel format. In the Reshel the Vault of the Sun its the "Teyth" pole side which is also described in terms of the Yud pole it links with in creating "Vaults" (specific creation realities... the work of the day). It's spin-ring (Solar.Is) is the Great Pyramid apex-coded ring AND it is loaded by the golden ratio spiral from the Vau pole (Sacred Heart, etc.) and its tetrahedron systems. Two major life supporting systems. In that position in the Reshel it is the SEEDING function (the "green", eastern generating pole) ...male. This is the Boaz Pillar or the Teyth rhombus/Gate/Pillar function. ALSO in the geographic (NE) site its the same thing in the X-cross, ie the HEEL STONE for the Arkhom. The Heel Stone is the interface up/download system inserting spiritual software into the Arkhom and also returning processed Sophia (female) wisdom (the male half of the Reshel processes the male wisdom) ...this 8-point format is in the TEMPLA MAR schema used for Metatronic temples/functions. (1) Synthesis of the 4 socket points which provide a form of cosmic life-definition rhythm... the Circadian (Sun) Rhythm is close to it in this reality, also the 4 human biorhythm frequencies. The apex, vibration is "50" which is the serpent, letter nun, in the Hebrew alphabet: regenerating Life (in cycles)... which correlates exactly with the apex, also other "50" interpretations in scripture. VAULTS OF THE SUN: Already partially described above but they also merge with the Pools of the Moon when the two halves' Resh (head/face) poles merge in the center. In effect they unify the Moon and Sun dynamics... the "moon" correlating with basic life systems, not just a rock in orbit. The Selah Essence (life) infuses both the Sun and Moon... and all stones/matter... and then express outwardly as the Sun or Moon in their externalization. (That in itself is a major study that would be needed here.) But the merging also creates the ECLIPSE EFFECT. This has been experienced by many as a gate's opening: nullifying active cosmic codes to open a door past them into Reality, for new coding. This is a highly simplistic idea but it works. Basically this "gate" flashes open with every cycle of the Reshel halves. "Enter Hierophant, from the Lion Gate. Impress the Logos of Mind upon our anointed foreheads. We seek thy meditation with Divine Form, inscripted into the terrestrial manifest of our world. In us, do we become Creation through the breadth of the Sun and the depth of the Moon., the two conjoined in expansion and contraction as a Sacred Atom in the heart of our most holy spaces. ...The Seeding of New Creations through the cooperation of Like-Mind ...Interfacing of Dimensions, the 'Primary Substance' of Generation, The Fluidity of Co-Creation Projected into the Waters of Life. Submerge to the depths, rise to the Light--all images are reflections of Dolphin Play. Keep thee to thy domain as a cub to his den. Soon winter will pass and the seas will warm again and the earth will fulfill itself. The Lion is the Guardian of the Pools of Life. The Solar Lords command the seeding of the Universe. It is both the Vault of the Sun and the Pool of the Moon in co-creative harmony. The HOLOS is the Universal Seed format according to Thoth Raismes (Maia translating). It applies to atoms and galaxies. Its the main pentagram system, the overall format of the Reshel: the apex being the Zayin/Zion pole at the top and the two Pools of the Moon at the base. The Shiyn pole is the Quint(5)-Essence pole or the seed of the seed. There are the two seeds: male and female in the two halves, or two penta-stars. I've sent the HOLOS copy out before; if you need it I can send it again. The Seeding-5 is also found in the 5 rivers and lands that form Eden (controlling foundation), the 5 breaths of the Maitri Upn. 2.6, and the 5 elements of the Revelation 3rd Seal activation... the Scales translate as "Selah." These are important examples but each is described in the terms of the creation its seeding. The HOLOS is in the more central template. The interpretation of the HOLOS is beyond my capability however. It shouldn't be but it is. The Ossipee is overall a Seeding site in function, as a NE Heel Stone, and the Yud/Teyth side of the system as the Vault of the Sun with its two main systems in mutual support: the Pyramid and the golden ratio spiral which originates in the apex but is further upgraded by the Vau pole. The Solar.Is ring is directly from the apex. The Yud pole is linked by a straight line through the center of the golden ratio rhombus (Gate/Pillar/manifesting system) labeled as the Teyth pole. All of these go into the description of the Sacred Vault of the Sun. Most importantly one must also understand that the Sun is a cosmic being or "Solar Lord"... the true citizen of Time. We as humans are divine models of the Universe and beyond but our form in any Star system will be a harmonic of that system. The STAR/SUN is the primary soul of the system, basically uniform in nature with the other stars. Mazuriel is the Central Sun of all Central Suns and the Sacred Heart of God (Manifest). Its main symbol is the 6-spiral wheel as seen in the Barbury Castle X-gram, and others. I've sent this before but can again if you've lost it. Its one of the most important "systems" the Nartoomids/Thoth have published and its probably the most used in the scriptures. Ossipee uses this system as the NE Heel Stone pole, as a means to further refine the greater seeding format. http://www.spiritmythos.org/holy/seals-symbols.html Look at the Ben'ah Seal, the center one of the 5 shown. This is a dual dipole Dion Couplet, basically. The red and green mountains (poles) are reversed in the graphic due to there being a reversed polarity in the dual dipole expanded form of just having two poles alone. This one is the one used most, including the Ehye Asher Ehye (I Am That I Am) or Heya Resha Heya name of God. Correlate the emerald with the EMERALD MAR, Emerald Tablets, light green of the Revelation 3rd Seal (in its transmuted POSITIVE functions! ), and the basic female function: to create cosmos resonant with the Divine Harmonic of Universal Accord. The open on her side is the male input from the wand, her right brain function. The Ruby is the Sophia Wisdom from the Emerald processing, the male's left brain. The wand, male right brain, picks up the fire-codes from the Central Pillar (a resonance effect) not shown in the graphic. http://www.shameer-orion.org/pdf/osiris08jpg.pdf This is one of a number of worksheets using the Reshel in the Couplet. The basic mural is from the Hathor Temple at Dendera. Just an example of its sophistication. This worksheet is looking at the Pyramid overlay, of the Reshel. Deep research into the Vault of the Sun would have to go into this kind of development. NOTE RE THE PRESENT OSSIPEE SITE FOCUS: The MESSIANIC GRID grounded when Hussein's infrastructure was cleared from the primary E-W connective ley (note http://www.shameer-orion.org/pdf/Azalah02.pdf ). Since then many major systems have been expanding and strengthening while that E-W ley is clear and the whole Planet/Race can gain inertia. The Tsunami event responded, in its up-side, to the 9-11 event in the other Gaia/Racial brain half: one human generated, the other Planet generated. The European system has been radically expanding and this means that the Arkhom/Bakhira (and Nova Scotia) Reshel system can then respond. The SEEDING function of the Arkhom must first expand: ie the Ossipee Vault of the Sun area in Arkhom. I think that is a focus for more activity in that NE area along the same function. Comensurate with that, the NW and other "X" cross points will respond after the spiritual NE-SW axis is up to speed. If active light groups were working, using the Reshel/Arkhom harmonics, this would greately help in facilitating our part of the expansion. Our group here can assist, in the Ascension Grid crown chakra, the 7th of the 8 now active. Also, light groups in the Edinburgh area would be key as its an interface to the European forebrain matrix grids. The Dunford's area links with that. Most of the persons in the above list have been critical in the Edinburgh/Rosslyn expansion which is still ongoing. Certainly the collective effect of all the groups in the Planet/Racial Mind/Soul, at all levels, define the progress HOWEVER the PRIMARYsystem driving Ascension and the LP-40 shift is the Techad/Reshel. So groups and grids using that format will have the most direct impact and will be able to work with Hierarchy more directly and in a wider spectrum of activity having more exact proceedures related to Ascension. This was why the Templars and Masons used it and built many major temples based on it. Its the reason the Rutans originally used it and why we are now focused in the same. And this is why Ossipee, in the Arkhom Reshel, is of major importance right now in the greater Work.